In a nutshell: Samsung's affordable and popular Galaxy J5 is a mid-range smartphone with a very attractive slimline design and good performance. Its best features are its impressive HD AMOLED screen, decent camera and outstanding battery life. The Samsung Galaxy J5 looks very much like a classic Samsung phone. It's available in Black or White, and has a familiar but attractive rectangular style with rounded corners. It's very slim for a mid-range phone, measuring under 8mm in thickness, and weighing in at a solid yet not too heavy 146g. The phone feels good in the hand, and isn't too big to use single-handedly. The screen is a very nice size for a mid-range phone. Measuring 5 inches, it's large enough to enjoy photos, videos and games, yet not so big that you struggle to slip it into your pocket. It's a HD display with a pixel density of 294ppi, making it fairly nice and sharp. It's one of Samsung's high-quality AMOLED screens, with plenty of brightness and contrast too. Design-wise, this is exactly what we want from a mid-range phone, and the trade-off between size, screen quality and materials used is just right. Running Android 5.1 Lollipop, the J5 has a quadcore Snapdragon 410 processor as its beating heart. This runs at 1.2GHz and has 1.5GB of RAM available, giving it good mid-range performance - significantly better than the Samsung J1. Perhaps less impressive is the meagre 8GB of built-in storage, which doesn't offer a lot of room for apps, videos and music. You can add a microSD memory card for up to 128GB of additional storage, but we feel that the basic 8GB is rather tight for comfort. The standard camera configuration for a mid-range phone in 2015 seems to be 13 megapixels with HD 1080p video recording, and that's exactly what the J5 has. It's a competent camera that does what most other smartphones at this price also do. The front camera has a 5 megapixel sensor, and is just right for selfies and video chat. No surprises here. The J5 has all the connectivity options that every similar smartphone has - 4G LTE, Wi-Fi, Bluetooth, USB and a headphone jack. To find your location, the phone has access to A-GPS, GLONASS and Beidou positioning. The phone has a large 2,600mAh battery, which can provide up to 18 hours of talktime and ought to be good for two days of moderate use. It's an area that many low-end phones get wrong, and the J5 seems to get it right. The price of the Samsung J5 is competitive, and it does what a mid-range smartphone ought to do, without any nasty surprises, making it a very safe choice. One of its best features is its slim, elegant design, and if you've used a Samsung Android phone before you'll feel immediately at home. The screen is a good size and is of good quality. The camera takes decent pictures, and the processor is up to the job. Battery life is strong. The one area of compromise is the 8GB of storage, but you can extend this at low cost with a memory card. The new Samsung J5 (2016) offers a more upmarket design with some enhanced features. What colour can you get in Samsung galaxy j5? I'm using a dual SIM, then I can't access my sd card. Is it because I have two SIM cards In the phone or is it something else? I'm pretty certain that the sd card holder doubles as the second sim slot. Hi I don't have reminders on my phone.. it's there but doesn't show on phone the time something should be reminding me? This really is just a phone. Nothing else. Why? Because it has no memory capacity. Many models will not allow you to transfer apps to the memory card with the result that the 8gb internal storage is all you have. Not only that but this meagre 8gb is stuffed full of pre-installed non-functioning bloatware. Much of it won't work because, you guessed it, there is 'insufficient memory'. Samsung should be prosecuted for ever launching this piece of junk without a major health warning. Wish I could give it zero stars. I love my Galaxy J5. I use it for listening to music and the camera, which is excellent. I love the extra memory allowed by the sim. As an OAP, who has had 2 iphones, I was worried about a change of phone but have found the J5 very user friendly. Only problem I had was changing my music from itunes to mp3!!! But that's Apple trying to keep customers, not the fault of the J5. Worse phone ive ever had when it comes to storage. Bought sd card and most apps you cant move onto it. The 8gb is full of system storage. Cant wait for contract to end. I bought this phone on-line and it is fantastic. Charges up very quickly, the internet is amazingly fast and the storage can be up to 256GB's. Look no further, it's a right cracker. This battery is awful.....and why would Samsung sell this phone with its useless storage..The majority of the storage is system storage. I have had this phone now for several months. It has not proved to be one of my better purchases in spite of careful research before buying. The memory is struggling and each update requires another of my apps to be uninstalled and I don't have many left to lose! No magnetometer means no compass which means no star charts so my night sky gazing is no more. Even my previous phone (a much cheaper spec) included this and I had no idea that any phones were designed without. The auto correct/predictive text goes overboard and I end up having to scrutinize all outgoing texts to make sure that words haven't been changed whilst I finished my message. Now looking for a replacement with compass. I have had this phone for a couple of months now, it is like the Galaxy S5 without all the samsung built in apps and bloatware you get with it. I did originally love the phone, but, a few downsides. Despite sticking in 128GB ram, it still insists theres no memory left after installing a lot of apps, there doesnt appear to be a way to change this. After weeks and weeks of enduring the god-awful autocorrect I'm worried if I dont change my phone its going to make me ill ; for some reason the autocorrect is loaded with incomprehensible words that somehow make a better choice than the one your typing. The worst is when you type 4PM and it decides 10AM is somehow better....I have turned auto-replace off, but if it turns itself back on I'm going to end up throwing this phone at the wall, Its such a shame because its a great handset too. For this reason I'm giving it 2 stars. A very nice phone but I can't use my favourite music as ringtone. Please can you help? I love this phone but how do you find out how to go back to just talking to one person on your phone .as i put it to know whos calling when on my phone but cant rem what i went in to i know its settings ..help ???? Samsung j5 was good i like it. 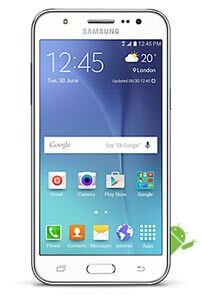 Buy my Samsung Galaxy j5 mobile phone from moister in puerto del Carmen Lanzarote for �188 good phone. My samsung j5 was good at the beginning later it started having issues like it freezes and hangs alot. Some times it hangs then reboots on it own. Recently it hung for a while so i tried switching d device off and on but it refused i had to remove the battery and put it back again. I didn't expect such problem from samsung. I Have had this phone since December 2015 but I would not recommend it to anyone. The phone, as has been mentioned has its good points but for me the negatives far outweigh the positives. Funnily enough the battery life on my device is awful, the predictive texts is the most frustrating thing I have ever experienced. Even when you manage to bypass or momentarily disable it, somehow it enables itself again. When you type a message it changes correct speling into gobbledygook. When you have checked whole sentences or text's to ensure it is correct and press send the device changes what you have typed to something indecipherable. The screen freezes and becomes non-responsive the wifi signal drops non-stop. There are issues syncing email and everytime I try to open new tab there is terrible lag. The sound quality is pretty poor almost like a tinny sound. Overall, as I have said whilst a lot of reviews are positive, my experience has been the opposite. The phone is not overly expensive on the whole but, when it has as many problems as I have had with mine then it is clearly overpriced. Use Google keyboard for txting apps for others found that helped better than one you get with phone. Its a worst phone of my life. I gifted this phone to my mom on her anniversary. Just within 20 days the phone got malfunctioned. The phone is not starting up. Samsung call center guys says they cannot exchange this phone with new one since they have exchange policy of only 7 days that is just bizarre. I visited the nearest samsung service center in bhandup mumbai. Even the service center guy could not find the exact issue. From last 5 days its in the service center and today after i called them got the latest update that the J5 battery is out of stock. If the phone batteries is out of stock then why the j5 phone are still available in market. For the cost this phone is outstanding. Much better display, battery and camera than Moto g 3rd generation even tho the specs are similar. 8gb not an issue as memory card can be used and several apps and all photos have been moved leaving plenty of room. Got the gold from carphone warehouse on a good deal. Highly recommended as it looks good and perfoms well. Preinstalled with Microsoft Apps which can't be easily uninstalled, if at all, so if your not into Microsoft this phone isn't for you, unless you root it. No Marshmallow update at time of writing. As usually Samsung not great at OS updates. Impressed by camera and output quality both 13mp and 5pm. Good build quality, only let down by flimsy battery cover. AMOLED screen a bonus on budget phone, video output quality good, but you can just about make out some pixels which can be annoying. Have played 007 Spectre (DVD converted file) on phone with no lag and good output. Reasonable phone for the price. Very disappointed there is no magnetometer, This means no mag compass, which I do use a lot. Also, no message indicator light or charging light Both of Which there was with old Sony SP. Good battery life, however, I get 3 or even 4 days. Just got this phone Samsung J5 ,I think it's a brill phone ,easy to use like all samsungs phones,you can add more than one number to contacts etc home number email and mobile numbers ,you have to add contact to device not sim and then you get the options to add other numbers to contact. Contacts only shows mobile phone number. Galaxy ace had much more contact versatility - emails, work number, good number etc. A major weakness here that ruins this phone. You can add email and other numbers ,you have to add contact then tap store on device instead of sim and your alternatives show up and you can add home number emails etc. I have the J5 I do love it. one problem is I can't get the message repeat alert to work. I have sent the phone back. The New one still doesn't have the message repeat alert. Other then that it great. My wife had this problem too. I pulled the plastic film off the camera and it worked beautifully. Love my j5 only problem is there is no music player so not able to play any songs from my sd card. Hi, I use my phone a lot and when I got mine, it's automatically had Google Play Music installed. I should recommend this for playing music as the format is very swift. However third party apps are available. It is a shame however that the phone relies on downloading extras. My sister-in-law had this phone for only a few weeks as a Christmas present, but unfortunately spilled some liquid over it. She did not realise until it was too late, that the liquid got inside. By the time I discovered the problem, all the tricks I knew could not save it. My brother who bought the phone for her was not pleased! I actually did some of the set up on the phone, so can say that it was a good phone. It was responsive compared to the old Galaxy S3 due to the extra ram, and the screen large and clear. In use, the J5 was as good use as my Galaxy S5 Neo. Now the J5 will be replaced by the Sony M4 Aqua or the Motorola Moto G4, which are both water resistant, like my S5 Neo! Another thing is the rivals have faster processors, though the Motorola has less ram which may peg it back compared to the J5. The battery life was good. All seem limiting with 8gb storage, but the J5 has less bloat ware. The memory card that was in the J5 survived, and will be used in the replacement. No photos were lost, and I backed them up. The phone boots up with the intro tune, but the screen does not light. The S5 Neo is the cheapest Samsung which is water resistant, and costs over �100 more at the time. In this case, it would have been worth it! The J5 is lacking the one protection that killed it. A good phone if kept away from liquids. Only had it a week but so far its great, does what it sais on the tin, good for the mid cost phone.�Good Signal on EE internet and calls (which strangely is what I use a TELEPHONE for). Am on my 3rd Samsung j5 in less than 3 weeks as getting a signal is about as rare as hens teeth. Does not matter what sim is put in they just don't work. Am calling it a draw and going back to my old phone pity as it seems a nice looking model. As an 85 year old first time smart phone user, am finding my way around..
speaker sound could be a bit higher, and a pocket sound would be great. I guess i will survive..
great phone you have for a decent price its capable of high-end games with very minimal lag. I have purchased this Mobile on 25/2/2016 from RELIANCE DIGITAL EXPRESS MINI(Number:08042045390), KHAMANHALLI BANGLORE in 12226/INR, I will never recommend this mobile to anyone, the sound quality is worst , You cannot hear voice of ringtone, the speaker is given in back (near rear camera), If you are watching any video on UTube and same time if you recieve any msg the video will get paused.It doesnot support multitasking. Guys within one 5 days the prizes reduced by 700rs. Itself says how poorly designed this mobile. The phone is easy to navigate, nothing frustrating , great screen size good pics and much more great value. brilliant phone i got it for �1130 from vodafone pay as you go. I can't send music via Bluetooth plz how do i resolve dat? Asides dis d fone is superb! Great phone easy to use clear screen love it was told it was a rubbish phone but took my gut instic glad I did. Love my new phone, does everything i need, except cannot get to my music to use as ringtones on it. This is how I figured out how to do it. Go to settings-sound and notifications-ringtones and sounds-ring tone-scroll bottom of page to + add ringtone-sound picker, then it will show your music, so you can choose your tune for ringtone.....that's how I did it and hope it helps. I love my J 5 . I've had it six months now and not one problem apart from me using all my data because the screen is so good . I've not had any problem with it's storage but my needs are not that but I commend the battery life . It last for ages . Thanks Samsung you can have a big thumbs up. Terrible signal on EE, replaced the SIM then the phone and still had problems. Drove in the car over 22 miles and had no signal bars. No good in city centre with often no signal bars. Same at home and every where i travelled locally. I fired up my old S4 on my iffy Vodafone network - got 3 and 4 bars ouch! Worked fine on Wi Fi. So maybe it's the network EE. Thats no suprise with vodaphone there the worst network going. It is not the phone, its EE. A tv programme showed that 4g took bandwidth previously used for phonecalls. Hence customers complained. Happened here too, good signal then died. Still an issue after 4yrs with orange//EE. There head office rang me too .I left EE. My open phone shows vodaphone best signal!!!! On O2 now, was brilliant 90% of the time, has done same thing - signal gone at home, 50% time no signal, not enough internet to open email, O2 sharing vodaphone. Masts here - but cant fix problem till July 2016. 18 mnths wait so far. Been in regular contact with phone company for north west. Known issue. Ie get 4G , but get a landline to ring from home! Cheese. I've had all the Samsung phones and this phone is great for the cost I would recommend this phone to anyone. A brilliant phone. Does everything expected and will style. Battery life fabulous. Replacing my previous Samsung Young 2, no comparison love the J5. That's very useful info Karen. I've got a Young 2 and find it quite fiddly. Love the phone except the predictive text.... hardly ever predicts text correctly. It is an amazing phone. Love the J5. Very quick, expensive looking. Lots of features and apps. Phone was a gift to replace my samsung neo grand which I really liked. I downloaded a camera app which gave better results for photographs and videos front and back. I added a memory which is ok. Does everything I want it to do but wondering how it doesn't switch between mobile and data automatically same as my neo grand. I notice the screen is more sensitive then my former one and slightly smaller. For what I paid seems a good little fone. Still setting it up but will see how it fares but so far a good little fone. Hiya, which camera app please? The Samsung J5 is OK But not brilliant. personally I wouldn't recommend it. I got mine as B,day present near end of November. And keep having sync issues. Or not syncing in my case. all settings are on for this function that needs to be on. Still nothing. But hay, my syncing might work i may get to read my email. I no I didntnt, but wouldn't recommend at all. This phone does all the right things for me, large screen and easy to use ,very pleased with my new phone. For that reason this only gets a good review. Bought the galaxy j5 recently and am delighted with it. Its gold slim and very classy looking. Best phone I have bought by far. Samsung J5 is an advanced cell phone u can do whatever u like including Games , Gprs and with the battery you will never goes wrong it last a lot. This phone is great for outdoor operation in the sun. It has a manual extra brightness feature to boost the brightness if the normal setting is set too low. Great battery life and latest android OS. Memory with Sd card ok. For the price an excellent fast phone. Only lacks compass-big deal. Had this phone for a couple of months now - since my HTC M8 went pop - and have to say it is probably a better phone than the HTC was. It's fast and responsive and the camera takes excellent quality snaps. All for �150 when I bought it. I'm so impressed by the phone I've now bought two more - for wife and daughter for Xmas which were on sale for �130! As others have said, it does have a limited internal memory of 8GB and about 60% of that is taken up by the OS so there really isn't much left. However, it does have expandable memory and when 32GB cards only cost �9 it doesn't exactly break the bank! I've had this phone for a few months now. It is a perfectly adequate phone for the price, however, I did have some teething problems. The same day I bought it seemed to freeze on the ba kground image and I would then have to soft reset it to get it to work again. As it did this multiple times a day I returned it (to tesco) and they gave me a new handset, but I had the same issue again. As I'd set my own photo as the background I wondered if it would still freeze when using one of the premade themes, and hey presto, problem solved. This seems like a ridiculous problem and I'd like to know if anyone else had this issue? It was a massive faff to change phones again and I'm honestly not very impressed,especially as nobody could warn me before I got the new handset. Now it's up and running, it's a good phone, with a standard camera (though I find myself jealous of my friends' photos taken on an iPhone 6) and okayish storage if you use a memory card. If they could get the software problems sorted out and some more memory, I'd give it 4 stars, a better camera would make it 5. Laura (Review below) gave it one star as she does not understand how to download music??? Oh dear! Laura, you have so many options - Google Music, Amazon MP3, 7digital etc etc - each of these also have their own music player. Google Music is the best as it integrates very nicely with Samsung's sound effects (3D, Bass, Clarity, Concert Hall), equalizer and other music settings. This phone is retailing around �160 in the UK and it's very impressive. A HD S-Amoled 5" screen, 13MP rear camera, 5MP front camera (with flash! ), NFC, Bluetooth, WIFI and more importantly, 4G/LTE. The phone feels great in the hand, smooth lines and rounded edges. It may not be super slim, narrow etc, but at under 8mm thin, it's good enough. Yes it 'only' has 8GB internal memory but this is expandable with an micro SD card (up to 128GB) - a 16GB card costs you around �10 from many retailers - no big deal. You will be hard pushed to find a similar phone on the market, at this price point, with the specs that the J5 has. Got this phone for 170 pounds and it's a steal at that price. Nice big bright screen, good camera and the battery goes on forever!!. Only downside is only 8gb of memory, however as long as you don't want to fill the phone with music or HD games, it should be enough. Well done Samsung, good phone at a good price. how can we download music!!!!! 3 hours later wont play the music!! The Samsung Galaxy J5 functions on the latest Android operating system that is 5.1 with a powerful configuration. The screen size of the phone is 5.00 that are quite big. The device is equipped with 16GB RAM that is the memory storage and it can move up to 128 GB as well. The 13 MP and 5 MP rear and front camera.